Hey guys, I'm trying to setup a server on a linux (Debian Jessie) machine. 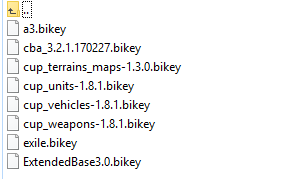 My main problem is that the server doesn't see to recognize my mods beside exile and i have no clue why. if I try to join with the config setting "verifySignatures = 1" he instantly kicks me for having wrong signature files (but i can play on other servers with the same mod / addon setting). 22:23:47 Mission Exile.Chernarus read from bank. So what am I doin wrong? Did i missed something or did messed up everything? I found the error myself - I'm a total retard that's it.